Western Weekend got off to a wet start Saturday, which contributed to the large-animal livestock show being canceled. Because only three cows were entered this year, people didn’t have much incentive to show up in the rain for the judging, one of the organizers told me. In the 1970s and 80s, 4-H members would show dozens of cows and horses outside Point Reyes Station’s Red Barn, which has now been painted green. 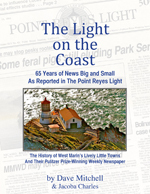 Back then, the building (which had been the engine house for the narrow-gauge railroad) was owned by the West Marin Lions Club and the center of many community events. No more. Talking to rancher Sharon Doughty, I lamented how few cows and horses have been entered in the 4-H Fair in recent years. “Well, look what’s happened to the ranching community,” was her response. It’s true. The number of ranches in West Marin has dropped drastically as a result of economics, residential development, and the continuing expansion of federal parkland. 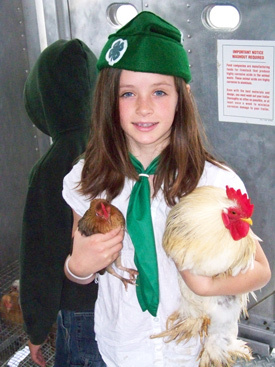 Nowadays rabbits and chickens are the main animals shown at the 4-H Fair. Nor is the coronation ball as large as it was when it was held in the cavernous Red Barn. Back then it was a boisterous affair, with a bar and dancing plus illicit gambling. The crowds were huge, and there were often fights in the parking lot. 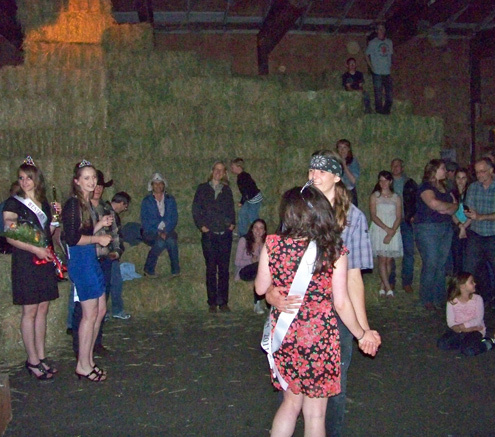 Nowadays, the coronation “ball” is a smaller, less rowdy barn dance in Toby’s Feed Barn. 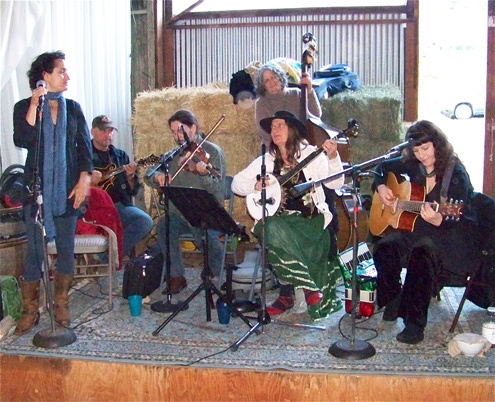 This year a bluegrass band and caller kept the crowd on its feet with square and line dances. After being crowned queen of Western Weekend, Alyssa Tanner, 17, led off the second half of the evening, dancing to the Queen’s Waltz. The winner is chosen based on how many Western Weekend raffle tickets she sells. Alyssa sold $7,391 worth of tickets, the most in the 62-year history of Western Weekend. Runnerup Jessica Arndt sold $4,870, which is well above average. She will be the Princess of Western Weekend and have her own car to ride in during Sunday’s parade down the main street of Point Reyes Station. The parade will begin at noon, and those planning to attend are hoping that the rain which has been predicted holds off. In the history of Western Weekend, it has never rained on the parade. Some years it rained right up to starting time but then quit. In other years, winds have been so strong they blew floats apart. 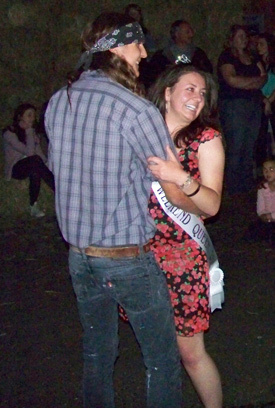 Jessica’s sister Ashley was last year’s Western Weekend queen. Here Ashley is at the far left, with Jessica standing next to her. 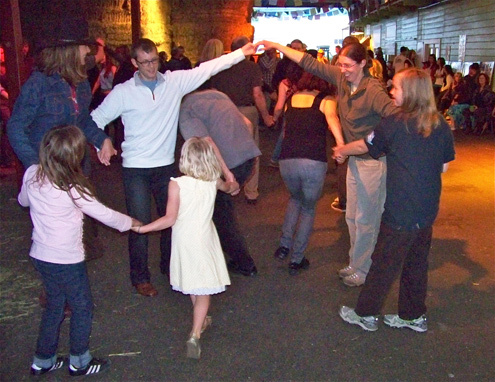 In recent years, the judging of small animals, as well as 4-H crafts projects, has been held at the Dance Palace. 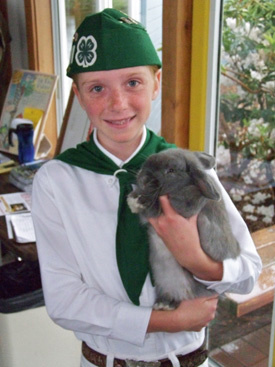 Erin Rose Charlton, 12, of Lucas Valley with her rabbit Sir Blue, which the 4-H Fair judges named Best in Show. 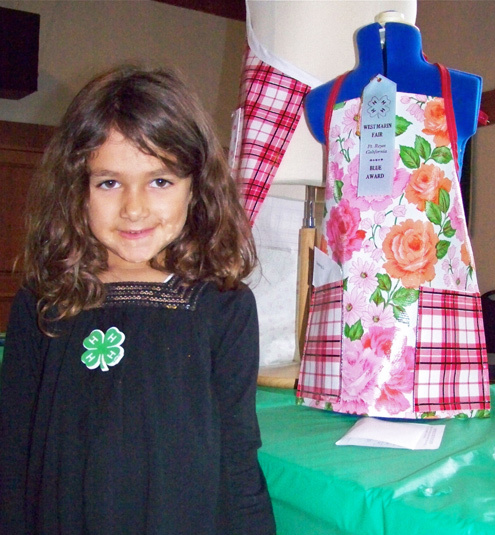 Brinlee Stevens, 5, of Point Reyes Station won a blue ribbon in the Sewing Division for her red-and-white apron at right. In addition, she won a gold ribbon for her pin cushion. Phoebe Blantz of Nicasio, who won a second-place ribbon in poultry competition, entered a white Old English rooster named Chief and a brown Old English game hen named Princess. Welcome back. I was wondering why it was off for a couple of days. I figured you were working on a new one and just got hung up and forgot to finish it. If I were you, I’d blame the Russians for the hack. No way it could be some local teenager practicing his skills before heading off to Leavenworth. Keith is responding to my June 9 posting about this post and the following one, which were hacked earlier this week.